Using your existing power cables as a network is a great idea, even if it has taken ages to get catch-on with the great unwashed, who appear to think that wireless is sexier. Well, for the home at least, it certainly isn't. Early versions ran at 14Mb/s and then 85Mb/s, but full fat 200Mb/s have been around for a while. That's fast enough to stream heavyweight data around and it comprehensively thrashes wireless – and it doesn't throw a wobbly if you don't live in a house made of cardboard. 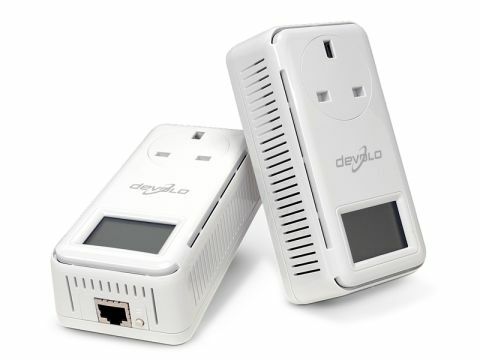 This new dLAN Starter kit comes with two units, and this time we get little LCD screens so you can configure the network without a PC. You can monitor it directly too. The pass-through adapter means you don't even lose a socket. Power consumption has been improved by a claimed 60 per cent. When not in use it switches to standby, which consumes just 2W according to our meter. In use we didn't see over 4W, either. The hardware appears well made and robust too. You can site the units up to 300m apart. Installation is really, really easy. The LCD screen, if you've got a PC somewhere on the network to get things running, is a rather pointless luxury. Once running you press the encryption buttons on each unit and you're 128-bit secure. The monitoring software reported an upstream data-rate of 194Mb/s and a downstream one of 189Mb/s. Which is, considering the overheads invoked on most networks, top-notch. So it's all fantastic then? No, because unfortunately it's just too expensive. The real rival here is not wireless, it's Netgear's Powerline range, which starts at £70 for two basic spec units. They're not as nicely made, perhaps, but offer a far better deal.